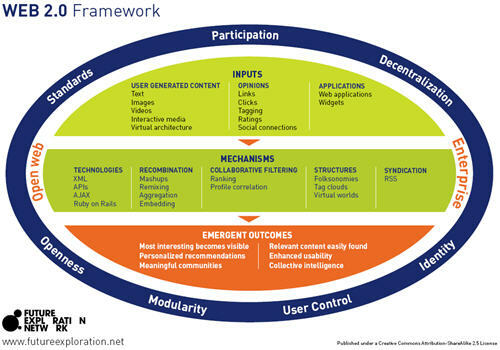 Here we go, first up there’s this Web 2.0 in a Chart by the Sunlight Foundation, connecting a lot of trends related with web 2.0 (real big pdf, hence there’s no useful thumbnail). 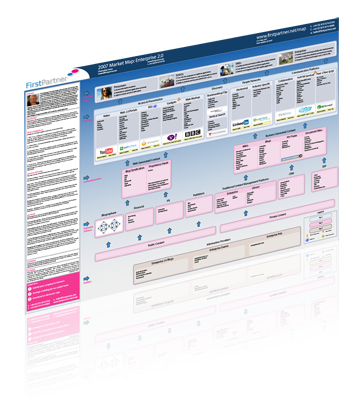 Welcome to the FirstPartner Enterprise 2.0 Market Map. Enterprise 2.0 is a term which many struggle to define and understand. We have therefore developed this market map to articulate the different attributes of this emerging sector. [This shows] the flow from the end-customer through the complete value-chain – covering blogs, wikis, collaboration tools, social networking and bookmarking through to RSS readers and Open APIs/Mashups. An Enterprise 2.0-sided take on visualization comes by Stephen Danelutti, who proposed an Enterprise 2.0 meme map (building upon the well known O’Reilly web 2.0 meme map). This I must say is my last favourite, as it mingles and mixes terms and concepts and lacks clear structure (but that is true for the O’Reilly meme map and others as well). When knowledge management (KM) practices, tools, and architectures burst onto the scene in the mid-1990s, they looked a lot like the old economy businesses that built them, hierarchical and workflow-driven. Now, Social Computing tools are flattening those architectures and extending the reach of KM well beyond the walls of the conventional enterprise to touch customers and business partners. Information and KM professionals are becoming knowledge facilitators, and they must get smart fast to capitalize on this trend. Although disruptive, Social Computing will transform KM, shifting the emphasis from repositories, which are hard to build and maintain, to more intuitive, tacit knowledge sharing. Social Computing is becoming the new KM, moving it from an often too academic exercise into the real world of people sharing knowledge and expertise with each other naturally, without even thinking about it. Overall I am glad that Forrester Research is pushing this specific application of social software, as this is good news for social software and knowledge management consultants like frogpond. But I would elaborate on their argument, basically because when many past knowledge-management projects and initiatives did not work out as planned, they did so rarely because methods or tools lacked. For social software to turn out successful, it can’t be sufficient to ponder, propose and promote (new) methods and tools. What is also needed is appropriate groundwork and background, i.e. paradigms and principles that guide the selection and usage of methods and tools, and insight into the nature of complex organizational systems. Emergence, connectivity and adaptivity are traits of organizational systems that are supported and leveraged by social software – good for organizational knowledge management but not restricted to it. If you’re eager to know more and are looking for social software support and consulting assistance, contact me. Managers spend up to two hours a day searching for information, and more than 50 percent of the information they obtain has no value to them. In addition, only half of all managers believe their companies do a good job in governing information distribution or have established adequate processes to determine what data each part of an organization needs. Wikis are more important than social networks when it comes to business technology buyers, that are looking for new ways to engage with their customers, e.g. in a B2B setting.